Vision occurs when light is processed by the eye and interpreted by the brain. Light passes through the transparent eye surface (the cornea). The pupil, the black opening in the front of the eye, is an opening to the eye interior. It can get larger or smaller to regulate the amount of light entering the eye. 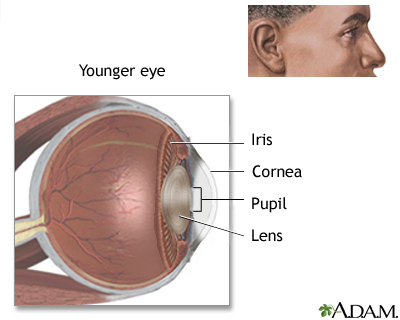 The colored portion, called the iris, is really a muscle controlling the pupil size. The inside of the eye is filled with a gel-like fluid. There is a flexible, transparent lens that focuses light so it hits on the back of the eye (the retina). The retina converts light energy into a nerve impulse that is carried to the brain and then interpreted.